Thundering herds of lizards roam Cretaceous America, and the earth trembles with their passage. Enormous yet graceful meat-eaters shred the still-living meat from the bones of placid plant-eating saurians. Tyrannosaurus rex, the most fearsome carnivore that ever lived, is king. But even T-rex isnt safe from the greedy eyes and the ravenous appetites of a band of bird-quick Deinonychus. 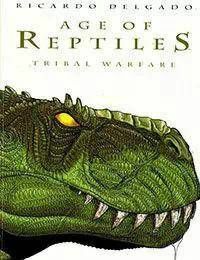 A tale from an age before humans and language, Age of Reptiles: Tribal Warfare is a 128-page epic told entirely in pictures. Ricardo Delgado, production artist for Star Trek: Deep Space Nine, has crafted the finest graphic novel about dinosaurs ever released.